Hamsterdam from Muse Games might just be the sleeper hit of the show for me. What I experienced playing it was a mix of frantic motion controlled madness, a reflex testing boss battle and just a large chunk of good old fashioned, social gaming fun. As well as offering different and exciting ways to play, Hamsterdam is cute and charming, offering a cartoon aesthetic that will appeal to kids paired with the pick-up and play nature, will offer all around family fun. The first level that I played saw me take to the streets with our little heroic hamster. I used the Joy-Con individually, one in each hand and with a flick of the right wrist attacked my foes, whilst a swing of the left would act as a parry, vital for filling up the combo meter. Once the combo meter was full I unleashed a furious attack, causing some serious damage. This was done by holding down ZR, dragging the now illuminated combo icon directly onto the enemy of your choosing. After that, I played the games 1st boss fight, which as I alluded to earlier, mixed the formula up even more. Instead of the previous method of flicks and tricks, I instead used the D-Pad to avoid an enormous and somewhat angry rabbits attempts to squish me like a mere bug. The clue was in the eyes as to where he would send his pummeling fist next, as he always gave a visual clue as to where it would be. After a few swings, hamsters would fly into the fray and start nibbling at our foe while even further through the sequence, smaller rabbits proceeded to throw bombs at me. The variety afforded over just two levels was genuinely impressive and leaves me excited to see the final product, when Hamsterdam arrives on Nintendo Switch, this summer. Heave Ho took me completely by surprise. Having received a PR email to come along and play it a little, I was totally blind as to what to expect going in. What awaited me as I entered the room were loud cheers and laughter, for once not at my expense. The booth was set up to accommodate multiplayer fun, four stools in front of a display, and four vanilla Pro Controllers tethered to the TV stand. I watched in childlike awe as the group in front of me frantically and manically tried to navigate four heads with over sized arms, from a lone platform to the goal. What was this derpy delight etching its way into my cornea, turning these seemingly previously normal people into the kind of characters who would often wind up as Batman villains. And why did I long to play it so much. When my time came, I sat with three complete strangers and we all set about creating our custom avatars. I was the pirate type, complete with eye patch, whereas one player was a cowboy, another an alien and the final participant sported a fine snorkel paired with a ski hat. We then had the buttons explained to us. ZL to grab with your left hand, ZR for your right and move with the directional stick. From the off, we set about grabbing one another’s hands to create a chain and then proceeded to head to the edge of the ledge, safe in the knowledge that ‘Cowboy’ was holding on tight and we would be able to swing across to the goal. So far so good. As we continued to create momentum, we yelled at ‘Cowboy’ to let go of the ledge. Instead, he let go of ‘Alien’ and myself, ‘Ski hat’ and ‘Alien’ all plunged to our untimely demise. It took us over 8 minutes to successfully navigate our collective way to the inaugural level’s goal, but not once did frustration set in. Instead, we chatted, laughed and exclaimed like a group of friends that had known each other all our lives. The following level we cleared in four minutes and the one after in two and a half! What Le Cartel Studio and Devolver Digital has created is an incredibly accessible and engaging couch co-op experience which will be delighting and exciting us all for many an evening when it releases this summer. 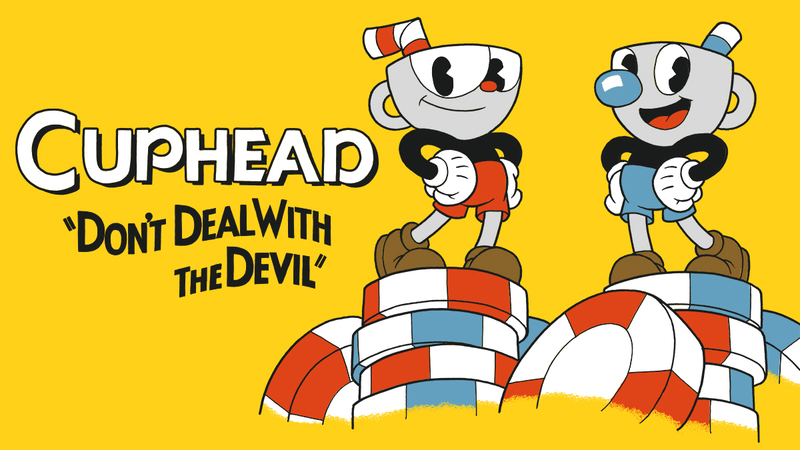 Cuphead’s imminent arrival on Nintendo Switch got a lot of people excited when it was announced last month and as such, I was excited to see what all the fuss was about. The queues for this one bordered on hysterical. Clearly this was a game people wanted to play on the Nintendo Switch. Once my facial hair had returned to the length it was prior to the previous days trim, and I had a Switch Pro controller comfortably nestled in the palms of my hands, I set about checking out this, admittedly, beautifully presented side scrolling-shooter. Actually, that’s a filthy lie. Two things happened prior to me getting some hands-on time with Cuphead. Firstly, I chatted casually with the attendant, inquiring about the show in general and the popularity of Cuphead at EGX this year. He proceeded to tell me that this waDuring my time at EGX, I did play more than just SteamWorld Quest and as such, here is a round up of three more games I played, and what I think of them: one of the first chances for members of the discerning public to play it, ahead of its release later this year. No, Late summer/ Autumn he continued… Okay friend, let’s just leave it there. I then asked him if it was possible to play in handheld mode, ahead of its release on April 18th. Understandably, it wasn’t and so I played on the TV, unable to see how it performed in handheld. In fairness, the game looks and sounds sublime, docked, the hand drawn aesthetic really captures the 1950’s Disney cartoons it is so evidently inspired by. Kristofer Maddigan’s original conceptualised Jazz soundtrack is just delightfully decadent, the brief snippet that I heard of it from the games opening level evidence enough of its opulence. Cuphead however for me just wasn’t an enjoyable experience, with the gameplay falling flat incredibly swiftly. Being a side scrolling-shooter, the screen moves from left to right automatically and you must navigate Cuphead or Mugman across the screen, avoiding projectiles, falling items from the sky and disposing of enemies to boot. You fire with the Y button, which can simply be held down. After that, it’s simply a case of traversing the level, dispatching enemies and jumping as required. For whatever reason, it didn’t really resonate with me, despite its obvious beauty and intriguing difficulty level. Maybe when the game launches later this year, on April 18th, my mind can be changed. Thanks for reading. For more on Cuphead, you can look forward to our full review of the game, which is being handled by Ali and will be posted next week.